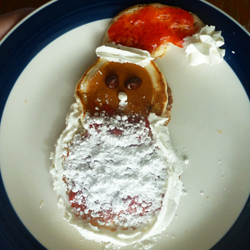 Here’s a fun way to enjoy breakfast during the Christmas holidays – snowman and Santa Claus pancakes! You don’t need any special talent to make these pancakes. But what you will need is pancake mix, chocolate chips or blueberries, whipped cream or powdered sugar, strawberry jam and bacon. 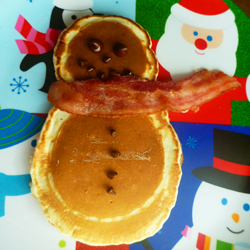 To make a snowman like the one shown above, simply pour two circles of pancake mix in the frying pan to form the body. Make sure to pour the circles far enough apart that when they spread out and merge the circular shape still remains, rather than making a big lumpy shape without much definition. When the pancakes are done, add chocolate chips or blueberries for the face and buttons and a bacon strip for the scarf. 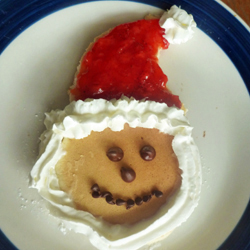 To make either of the Santa pancakes, create Santa’s face first by adding chocolate chips or blueberries to create the eyes, nose and mouth. Then cut another pancake into the shape of a hat. Spread strawberry jam on the hat and then add whipped cream or powdered sugar to create the fluffy white “fur” trim. Add more whipped cream or powdered sugar for the beard.